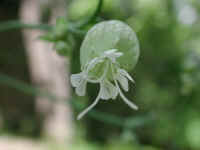 (Bladder Campion - 01) The easiest way to spot a bladder campion is from the balloon-like calyx or sac which is formed by the sepals, and the five deeply notched petals. 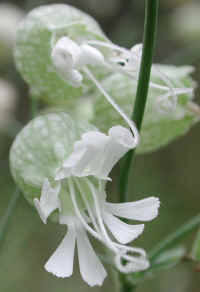 The bladder campion is a member of the Pink family (Caryophyllaceae), which was imported from Europe. (Bladder Campion - 02) In this photo, we have a close-up of the deeply notched white petals of the bladder campion. The ends of the petals also have an irregular toothed or scalloped shape, a fact we have not seen mentioned in the literature. 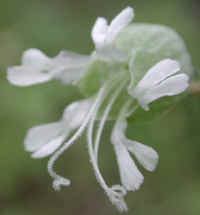 The literature also says that the bladder campion has 10 stamens and 3 styles. The styles are easy to observe, but we have not been able to identify 10 stamens. 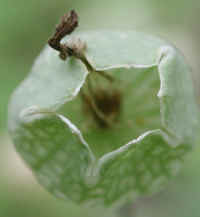 (Bladder Campion - 03) In this close-up of an old (flowerless) calyx, we can observe its pale green color with its dark green veining. According to the literature, the veins can also be red. 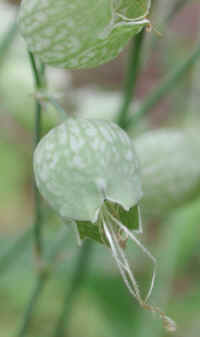 (Bladder Campion - 04) This is another look at the globular calyx of the bladder campion after the flowers have faded. 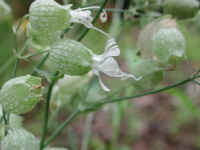 (Bladder Campion - 05) In this photo we have a side view of the bladder campion calyx and flower. 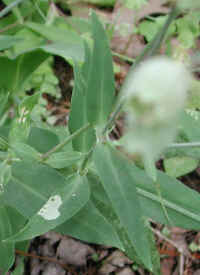 (Bladder Campion - 06) In this photo, we were focusing on the leaf and branching stem structure of the bladder campion, which can grow to heights of almost two feet. (Bladder Campion - 06a) In this photo, we have a closer look at the way that branching stems of the bladder campion grow from the leaf axil (bottom center of photo), and some of the new flower buds (upper left of photo). 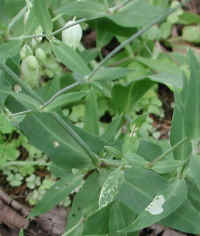 We can also see that the leaves of the bladder campion are hairless, lanceolate to somewhat ovate, and grow opposite one another. 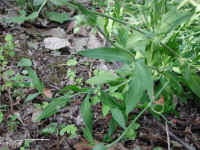 (Bladder Campion - 07) On the left side of this photo, we can see a newly sprouting branch growing from the bladder campion leaf axil, and a more mature branch on the right side of this photo, just below the leaf upon which someone has recently dined. 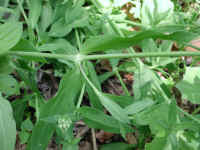 (Bladder Campion - 08) This is a side view of the leaf and stem structure of the bladder campion. (Bladder Campion - 09) Even after the flowers of the bladder campion have faded, the distinctive calyx remains to help with identification. 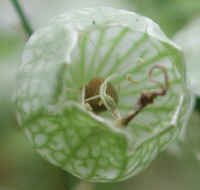 (Bladder Campion - 10) This is a close up look at the narrower open end of the bladder campion. The more we observe this kind of detail in one area of God's creation, the more we become aware of the innumerable details in the whole of creation, and the more sensitive we become to the rights of every living being. 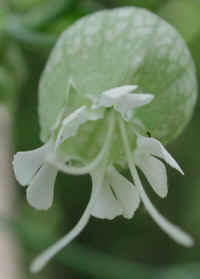 (Bladder Campion - 11) This is another look at the 3/4 to 1 inch wide bladder campion flower. 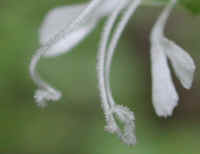 (Bladder Campion - 12) This is an "ethereal" look at a bladder campion cyme. 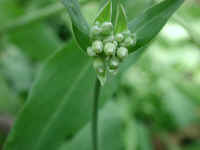 In the background is a newly developing flower bud. (Bladder Campion - 13) In this bee's eye photo, we can observe what we believe are the hairy styles of the bladder campion. 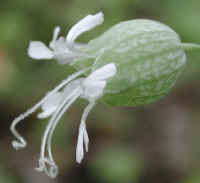 (Bladder Campion - 14) This is another look at a bladder campion flower. 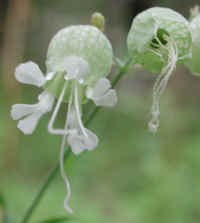 (Bladder Campion - 15) This is another side view of a bladder campion flower. 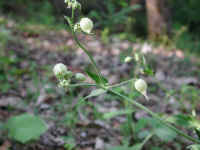 (Bladder Campion - 16) This is a bladder campion that is just beginning to bloom. (Bladder Campion - 16a) The large calyx of this bladder campion is just beginning to open. (Bladder Campion - 16b) As the bladder campion calyx opens a little more, the tips of the flower petals begin to protrude along with the stamens. 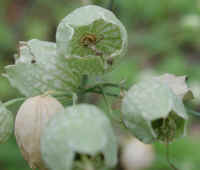 (Bladder Campion - 17) The leaves of the bladder campion begin to develop in a somewhat basal rosette, but as the plant matures the leaves can be seen growing opposite one another along the length of the stems. 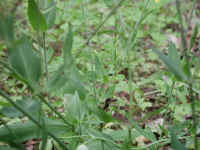 (Bladder Campion - 18) This is another look at the tangled stems and leaves of the bladder campion. 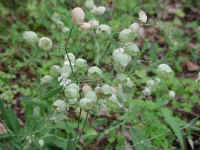 (Bladder Campion - 19) We took this and the following few photos on 5 Jun 2005 in our yard. 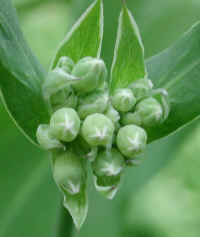 This photo shows a cluster of bladder campion flower buds. (Bladder Campion - 19a) This is a closer look at the cluster of flower buds of the bladder campion. 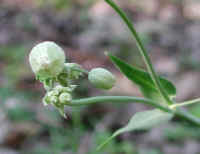 (Bladder Campion - 20) The bladder campion flower in this photo is just beginning to open. (Bladder Campion - 20a) In this bee's-eye view, we can see the 5 petals of this bladder campion flower that have just opened. 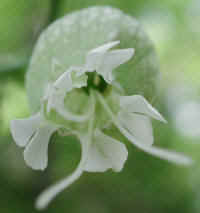 (Bladder Campion - 21) This is another bee's-eye view of the bladder campion flower.